NOAA Fisheries transfers 55 metric tons of Atlantic bluefin tuna quota to the General category for the October through November 2018 subquota period and closes the fishery as of Friday, October 5, 2018. NOAA Fisheries transferred 40 metric tons (mt) from the Harpoon category and 15 mt from the Reserve category and will close the General category fishery until December 1, 2018. This action is intended to provide limited additional opportunities to harvest the U.S. bluefin tuna quota while avoiding exceeding it. Although a proposed rule was published to increase the baseline U.S. bluefin tuna quota from 1,058.79 mt to 1,247.86 mt and accordingly increase the subquotas for 2018, the final “quota rule” is not yet in effect. The transfers result in an adjusted subquota of 115.7 mt for the General category October through November 2018 subquota period, 28.6 mt for the 2018 Harpoon category, and 3.5 mt for the Reserve category. NOAA Fisheries anticipates that General category participants in all areas and time periods will have opportunities to harvest the General category quota in 2018, including the December time period. The General category bluefin tuna fishery will close effective 11:30 p.m., October 5, 2018, through November 30, 2018. Based on landings rates in the September 2018 fishery and the October through November fisheries in recent years and anticipated fishing conditions, NOAA Fisheries projects that the General category October through November subquota of 115.7 mt will be reached at that time. The General category will reopen automatically on December 1, 2018, at the default one-fish level. Based on quota availability in the Reserve, NOAA Fisheries may transfer additional quota to the December subquota period. Persons aboard vessels permitted in the Atlantic tunas General and Atlantic HMS Charter/Headboat categories may not retain, possess, or land large medium or giant Atlantic bluefin tuna after 11:30 p.m. on October 5, 2018, through November 30, 2018. This action applies to General category (commercial) permitted vessels and to HMS Charter/Headboat category permitted vessels with a commercial sale endorsement when fishing commercially for bluefin tuna. 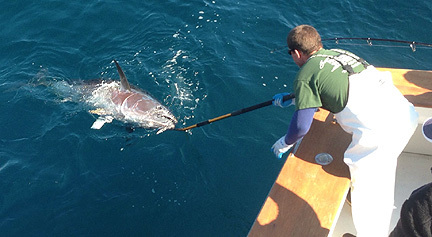 Dealers are required to submit landing reports within 24 hours of receiving bluefin tuna. Late dealer reporting compromises our ability to implement actions such as quota and retention limit adjustments or fishery closures and may result in enforcement actions. All bluefin tuna that are released must be handled in a manner to maximize survivability and without removing the fish from the water. Download the Careful Catch and Release brochure for more safe handling tips.